4kW Heat Output. Laser Burner Highly Efficient.CE & NF Approved. Very quiet in operation. CO2 Sensor.LCD Display.Built in fan to circulate air. Economical "Save Mode".Tip over switch to avoid spilling of fuel. Booster mode. Parental control. Fuzzy logic. WICKLESS DESIGN ; without installation, flueless space heater. This heater can heat up a volume up to 170 m³, which makes it an ideal, highly efficient and economical space heater. 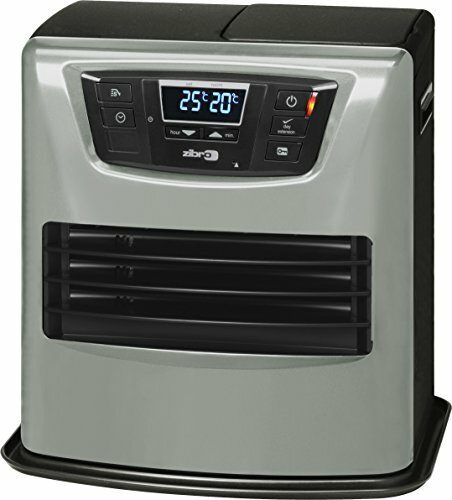 Semi - automatic operation : Features a 24-hour programmable timer and integrated thermostat controller to maintain desired room temperature. It offers 5 cycle burning mode (High - Med High - Med - Med Low - Low) Information monitor / Display / Weektimer: The LCD display allows you to monitor and keep track of all important heater functions.Progammable weektimer included, with set temperature 7 days ahead, 3 switch moments ON/OFF per day (total 21 settings). In case of power failure with maximum period of 10 minutes, settings will be kept in memory Automatic cleaning mode: Once the heater has run 2 hours consecutively, the automatic cleaning mode will start to clean the combustion chambre of the burner for 5 minutes. Removable fueltank : The heater is provided with a removable fuel tank with a capacity of 7.6 lliters, which will ensure a burning time of max 69.7 hours. Safety device : The heater is equipped with a tip over switch, ignition safety device, burning control device, safety device for power outage, High limit switch / overheat protector, Flame rod / Burner thermistor for incomplete combustion. On top this heater is provided with a built in CO2 sensor, which will measure the CO2 level in the room, not exceeding 1 % otherwise heater will shut off automatically, to have the room ventilated first. New SAVE mode: this system will permit the user to maintain the set temperature in the room without considerable variation. This system saves up to 8 % of fuel consumption. Also it will serve as an anti-freeze setting in colder places. Extension operation mode: When the fuel tank is almost empty, the display will show that the tank has to be refilled within 10 minutes. By activating the extension operation mode, the time to refill can be extended to approximately 60 minutes.